The real estate market in Denver experienced another fast-paced year in 2016, with strong price appreciation, historically low inventory, and the first interest rate bump in five years. The overall appreciation rate for 2016 landed us at an incredible 10%. What can we anticipate for the upcoming year in real estate? From our perspective, there are two key factors at play: 1) inventory and 2) interest rates. Inventory: New construction is far outpaced by Denver’s population growth, and that lack of new supply puts pressure on the existing home market. Although the new construction industry has revved up their production, there is a significant shortfall in the construction workforce, which means we will continue to see tight inventory for some time. Our housing inventory is currently down nearly 25% from where it was last year at this time…and last year we were down 25% from the year before! Due to our population growth outpacing our new-build starts, continued record-low inventories are projected, and more price appreciation is anticipated. Interest rates: The Federal Reserve has indicated its intention to adjust interest rates three times in 2017, but when that will happen and by how much remains to be seen. Although rate hikes erode affordability for buyers, increases take the pressure off the market, easing appreciation levels and balancing out the market. What’s to come: Along with slightly more moderate appreciation than in 2016, we anticipate heavy competition through the spring, and should see the market again level off and experience some correction in the summer and through the fall. The mortgage rates will start to creep up, but should move nominally through 2017, and have little impact on demand. For those wanting to put down roots in the Mile High City, it’s a good idea to buy, even with the competition and rising prices. You can pay rent at sky-high levels, or take those rental payments and put them into your own lasting equity. For those needing to move up or move out, timing the market and preparing properly will make the difference between maximizing your investment and simply selling your home. If you are in the market to buy or sell, or are interested in learning more about our services, please reach out. We are here to help! 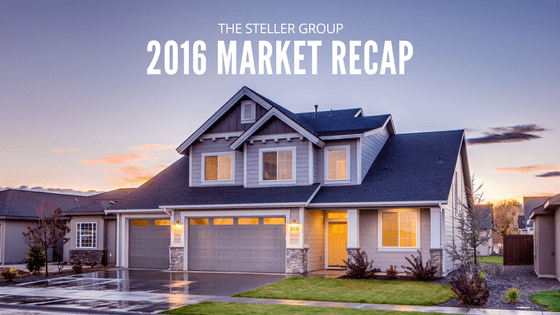 Call The Steller Group at (303) 539-5228 or email us at Info@StellerRealEstate.com.